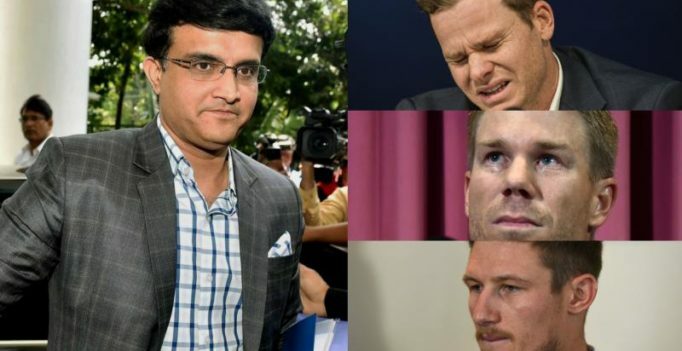 Mumbai: Former India skipper Sourav Ganguly on Wednesday backed Steve Smith, saying he sympathised with the former Australian captain and believed that whatever happened in the Cape Town Test was not cheating. “I sympathise with Steve Smith, he is a fantastic player and hopefully he will come back and keep scoring runs for Australia. Because I don’t think it’s cheating, actually I don’t believe it is cheating,” an outspoken Ganguly said after launching a book titled ‘A Century is Not Enough’. Smith and David Warner have been banned for one year for their role in the ball-tampering scandal in South Africa. Cameron Bancroft was handed a nine-month ban by Cricket Australia (CA). “I just wish them (Smith, Warner and Bancroft) luck and hopefully they come back and play well. It’s not right to call it cheating, and I wish them luck, and come back and (play) well,” Ganguly later told reporters. Smith on Wednesday said that he won’t challenge the ban imposed by CA. Cricket icon Sachin Tendulkar and India player Rohit Sharma were also present on the occasion. Ganguly and Tendulkar narrated several anecdotes of their careers and also spoke on the famous incident of Ganguly removing his T-shirt after the Natwest Trophy triumph at the Lord’s in 2002.